The church I go to, Imago Dei Community, does Christmas a bit different. Different, like, how Christmas should actually be, instead of how it is, with it’s Shopping Malls, Credit Card Debt, Vain buying of stuff that may entertain for a while, but has no lasting, eternal value. I have to pause here for a minute. Our society really has forgotten that Christmas IS about “eternal value” –We, as CHRISTIANS, celebrate the fact that Our Saviour was brought to us, in frail human flesh. We celebrate his mortal birth on this planet, the start in a series of events that ultimately lead to his humiliating, criminal death on a roman cross, for our sins (for the world’s sins) and his glorious resurrection 3 days later. I could in no way live a life without sin, but He did. Sometimes I can’t make it through the day without giving into a temptation of one sort or other, which leads me to sin and death, but He did. He lived and gave His perfect life in trade for my (for our) guilty lives, that deserve death and worse. You hear of people doing valiant, selfless acts like diving onto live grenades to save friends -Jesus died a slow excruciating death for us, only when He did, we weren’t even His friends, just some sinners who didn’t even care about Him. He died to pay for my sin, since God needs someone to pay for sin, He can’t just “let us off the hook”, because God is a God of Justice. God is also a God of Love and Mercy, so Jesus, He who is begotten of God, decided to pay that price for us. So, for NOTHING we’ve done or given Him, in fact, DESPITE all we’ve screwed up, Jesus takes the blame, the sin, the shame, gives us eternal life in Heaven, and while we’re here on earth He places the Holy Spirit in us to be our guide and comforter, if only we believe on Him! WOW, What kind of price can you put on that this Christmas? That, my friends, is Eternal Value! Today, this is how Imago Dei does Christmas – by giving more love and spending less money. The money we’ve saved so far by doing Christmas differently has funded a safehouse for trafficking victims in Portland, drilled water wells in Africa, and brought medical supplies to those who desperately need them, but there is still so much more good to be done. So Advent Conspiracy does things like the DIY fair — so that everyday people can actually create meaningful gifts for loved ones without spending a lot of money, and the money that’s saved can go towards those who actually NEED it. 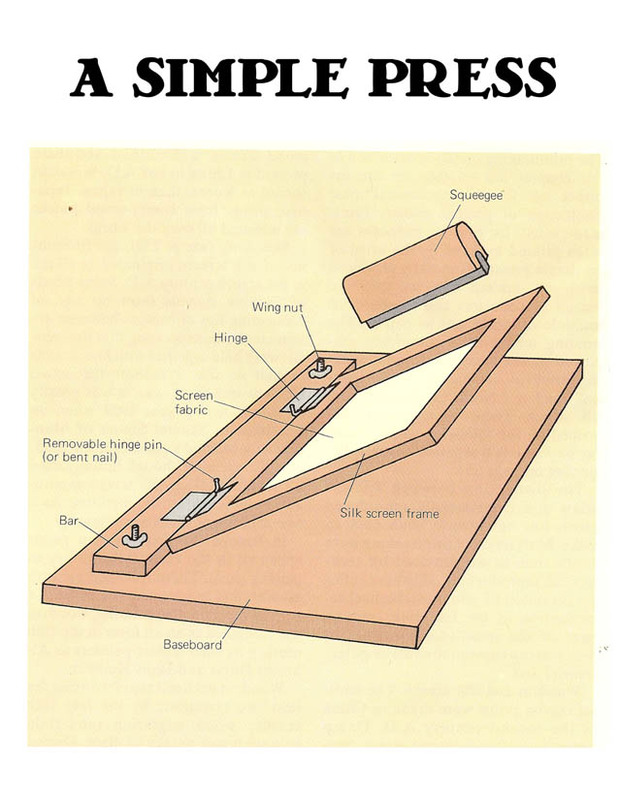 What follows are the uncondensed instructions to “DIY screenprinting”. MATERIALS: A silkscreen, bought or homemade/ an image to print/ either Mod-Podge or “Speedball” brand Drawing Fluid and Screen Filler/ Ink (this can be “screen printing ink” or acrylic paint)/ A screen printing squeegee, or anything that you can use as a flat blade -like a window squeegee, a spackle knife, or even a piece of plastic signboard could work. Practically all of these items can be found at your local art store. Step 1: GET A SILK SCREEN. You can buy a screen ($12-$20 and up) or you can make one using material you might have lying around at home. If this is a one-time project, you should make it yourself using a embroidery hoop and some organza fabric (NOT SILK-that’s just the traditional name for it, but silk isn’t used!) or other strong but sheer mesh, preferably not cotton. You can also build a more traditional screen by making a wood frame (or using a simple picture frame) and stretching the fabric over it —Please check out the links below for a more full education on this! Step 2: GET YOUR ART ON THE SCREEN. This is the hardest part, depending on HOW you’re getting the image onto the screen. There are about a dozen different ways to do this, each with their own pros and cons. I’ll mention 2 ways that are both fairly easy and more reliable than others. When it comes to your art, it’s best to remember that a screen print is basically like a stencil, so your art should be an image that can be translated strictly as a black and white image (but you can print it in any color ink). With either method, simple or complex images are possible; it’s all about how much time (and patience) you put into it. Before you do either method, trace the image. Tape the paper to the outside of the screen, then trace it on the inside –this is muy importante if you have WORDS for part of your image, since it’s really easy to end up doing this “backward”, making your SDROW DRAWKCAB! If it is legible on the inside of the frame (where you’ll be putting the ink), then you’re on the right track. Trace your image lightly with a pencil, or if you need a more visible tracing, use a micron-ink pen. After you trace your image, flip it over, take off the paper and work on the outside of the screen using either method. Please check out the links included for a more thorough education on either method! The Screen Filler Method (Direct block-out or “Negative Method”). This is done using either Screen filler or Mod-Podge to block out those areas that you do not wish to print. This allows the ink to be forced through the screen wherever the Screen Filler has not been applied. Simply paint all areas where you DON’T want the ink to go with either substance. If you plan on using this screen over for another image, use Screen filler, since Mod-Podge cannot come out of the screen. The Drawing Fluid Method (or “Positive Method”). Paint Drawing Fluid ONLY the areas that are the image with drawing fluid, allow to dry, then use your squeegee to coat the entire screen with Screen Filler. Once that’s dry, you can rinse the drawing fluid out of the screen, creating the finished screen. After you’ve done either method, and the screen is dry, tape the inside sides of the screen and the outside of the screen, any parts that didn’t get treated, or else ink will come through. But before you get your best material out, PRACTICE on scrap material FIRST, so you can get the feel of how to print your image. Place your finished screen onto the surface you’re printing on. Pour a bead of ink onto the screen, above the stenciled image, then pass your squeegee over the image smoothly and evenly. This is pressing the ink thru the open pores of the screen fabric onto the surface of what you’re printing on, so you might have to have a “light touch” or press harder, so PRACTICE IS NECESSARY for a good print. Then gather the courage and do the print for real! Print one, or print as many as your heart desires! If you printed on fabric, follow the instructions on the ink bottle to make sure it’s permanent. YOU’RE FINISHED! Clean the ink out of the screen by spraying it with water, then let it dry, and you’re ready to go again! Go to YOUTUBE and INSTRUCTABLES.COM and type “screen printing” phrases, and you’ll pull up all sorts of good information. Don’t be surprised if you find many more ways to get your art printed via screen printing- and don’t be afraid to try them! 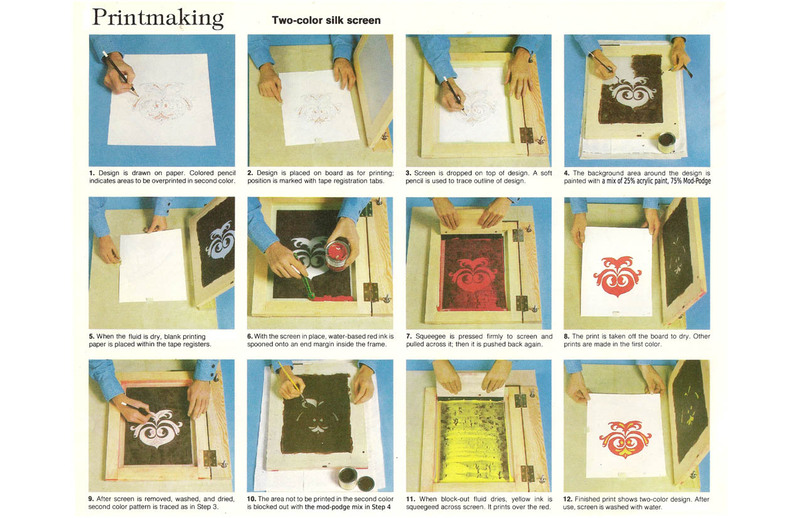 If you’re interested in the history or more general info on Screen Printing, read the Wiki Page! GOOD LUCK!!! I leave you with a nifty vid of the Preeminent Gig Poster Artist and a brief synopsis of one of his newest screen printed posters. This entry was posted in Uncategorized and tagged Advent Conspiracy, DIY, Eternal Value, imago dei, Screen Printing by larrychristensen. Bookmark the permalink.